It’s been a while since I’ve posted, due to moving “up Roth” and then having my bike stolen. It was a stereotype that wasn’t funny “don’t move to Liverpool, they’ll steal your wheels!” Well they did. Thankfully the insurance paid out, after a few months of back and forth and arguing over what constitutes a garage. I managed to find a great deal on a new bike from a dealer in Dundee! Unfortunately, I phoned my insurance company (Bennetts), since my policy is still in force, but the underwriter (AXA) won’t cover a new bike! I’ve been online, and it seems that nowhere will cover the bike when I declare the garage as a residential car park. Its a 10-space secure, covered car park owned by 10 houses. Even if I call it a garage, the best quote I can get is £1800!! (My previous anual insurance was £430). I expected a price rise, but this is just crazy. If anyone has any experience/knowledge of anything I can do, that would be great. It’s bad enough having my pride and joy taken (and missing the best summer since ‘76!! ), but to be deprived of getting back on the bike I want/love, is a low blow. Don't know if any are available where you stay but in Scotland I know lots of bikers who rent lockups that don't have garages and share the cost with room for 4 bikes. Cost is £35 per month a lockup so cheap if you share. 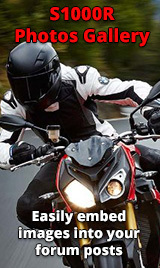 You have my sympathy , ive read similar scary stories from London bikers, what can you do but get something more insurable for a bit and wait for(hopefully just) a year or two. Firstly I hope you get things resolved and good luck - I’m pretty sure you will. You definitely won’t swing a shared private car park (covered or not) to the same status as a garage, but I’m sure all will not be lost. I was insured via Hastings underwritten by Axa for a few years (5 year customer at Hastings all in). I had a CB1000R but then changed in the last month of a policy to the S1R. Hastings (via Axa) would not quote cover stating “its too high a value” which was just rubbish. They wouldn’t allow that years NCB either being just 3 weeks short. Anyhow - looked online and Bennett’s quoted me so I took that - guess what ? Underwritten by Axa. Really shop around - if you want the S1R you will find something - the MT09 is a great bike but nothing compared to the S1R. I’ve just test ridden the MT10SP (which is pretty unrideable on uk roads) and the BM beats it hands down ! So, see what you can come up with - other options might be additional security (tracker) etc. If I quote for my old bike (ie saying that I’ve owned it for 2 years) the price is reasonable at £400. However, if I quote for a new bike, it goes up to £1200. Mine too was around a thousand pounds as i'm only 26 but the best way i found to get it down was to have an insanely high excess (£1500) and then a seperate insurance policy with another company (think it was like £40?) that purely covers my excess fee should i ever need to claim. so i spent an extra £40 but it saved me about £350. you might want to look into biketrac and alike though it could easily pay for itself with the insurance savings? Incidentally, I did test ride the MT-09. I was quite surprised by how much pep it had, but it’s either off or on - quite a little hooligan. It’s no SK1R though.